Many centuries before the country of Oman was formed, Muscat, its current capital, was a prosperous trading centre and an influential regional city. Located on the eastern edge of the Arabian Peninsula, Oman occupies a strategic position at the entrance to the Arabian Gulf. Shortly after Qaboos bin Said Al Said replaced his father (in 1970) and took control of the country, this ancient land gained its complete independence. Among needed changes, the new sultan’s priorities were social changes, as well as the modernization of the infrastructure and the improvement of its established oil industry. Then, in the early 1980s, this long-closed country (for visitors and western businesses) opened its doors to the outside world and to tourism. Oman is now one of the most hospitable countries with a rich tradition and culture that is warm and welcoming. Musandam is a governorate of Oman and referred to as “the Norway of the Middle East”. Geographically, the Musandam Peninsula juts into the Strait of Hormuz, the narrow entry into the Persian Gulf, from the Arabian Peninsula. The Musandam peninsula is an exclave of Oman, separated from the rest of the country by the United Arab Emirates. Its location gives Oman partial control, shared with Iran, of the strategic Straits of Hormuz. In the northern section of Musandam, around Kumzar, the language is Kumzari, which is one of the south-western Iranian languages and related to Luri and Persian. The Musandam Peninsula has an area of 1,800 square kilometres (695 sq mi) and a population of 31,425 people. Connectivity has traditionally been a problem for the region, but this has greatly improved since August 2008 with the world’s fastest passenger ferry launching service between Muscat and Musandam. Musandam is not only a strategic choke point for oil and gas shipping through the Straits of Hormuz but is also a choke point for fish migration between the Indian Ocean, Gulf of Oman and Arabian Gulf. The three huge water masses push water through the Straits of Hormuz and Musandam in and out of the Arabian Gulf. This creates massive currents and tidal changes and this is what brings in the big numbers of gamefish. 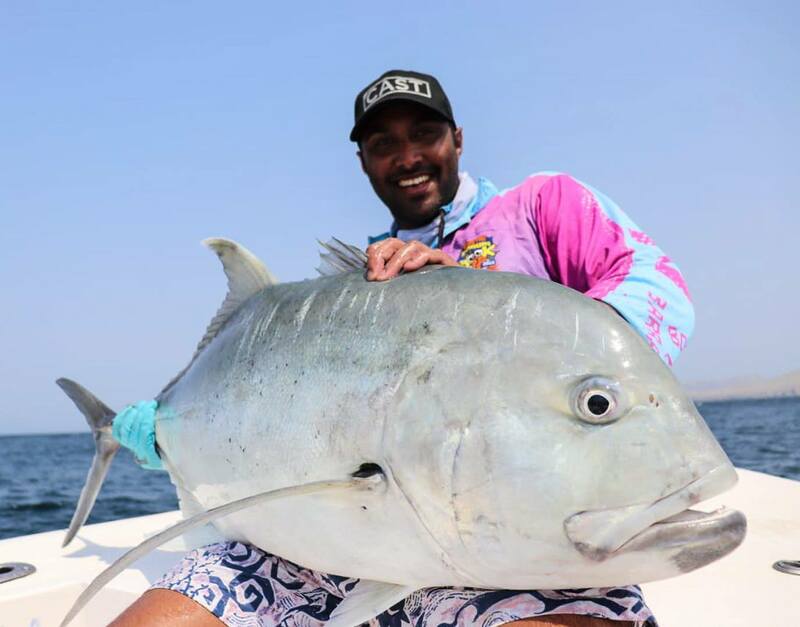 We have fantastic fishing for seasonal fish like sailfish, tuna and kingfish that are entering and exiting the Gulf but also for Giant Trevally (GT) which is our main target species and grow to monster sizes in excess of 60kg. Musandam was the first place in Oman that we discovered GTs over a decade ago and started the first Charter Operation in Oman targeting GTs and other gamefish, building Oman into a World renowned fishing destination with people travelling from the four corners of the Globe to fish our waters. We have done several TV shows in Oman including Robson Green, What a Catch, Off the Charters and Free Spool TV plus having many celebrity fisherman including Suzuki-san owner of Fisherman, Mogi-san owner of Pro Shop Mogi, Minami-san owner of Hots, Yagara-san from Shimano, Randy Chin from Temple Reef and JDM Tackle, Sami Ghandour from Race Point and Saltwater Tackle plus thousands of clients and friends. We run two centre console boats in the Musandam that are fully rigged to target large pelagic species and our Omani, Sri Lankan and South African captains are all well qualified and experienced to put clients onto trophy fish. We offer all of the required fishing equipment to be able to pop, jig, troll, spin and fly fish for the vast number of species in Musandam. We target a wide variety of species in Musandam with GTs being our main target but we also have sailfish, yellowfin tuna, longtail tuna, kingfish, queenfish, marlin, bigeye trevally, longjaw trevally, orange spot trevally, barracuda, rainbow runners and many more species. 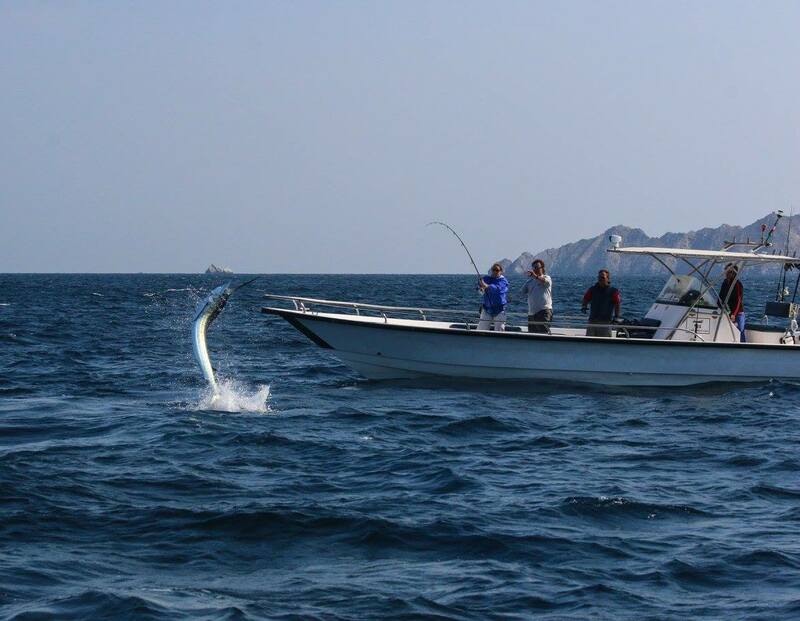 In Musandam, we are very lucky to have a wide variety of fish species and also a number of different style of fishing techniques that we use. 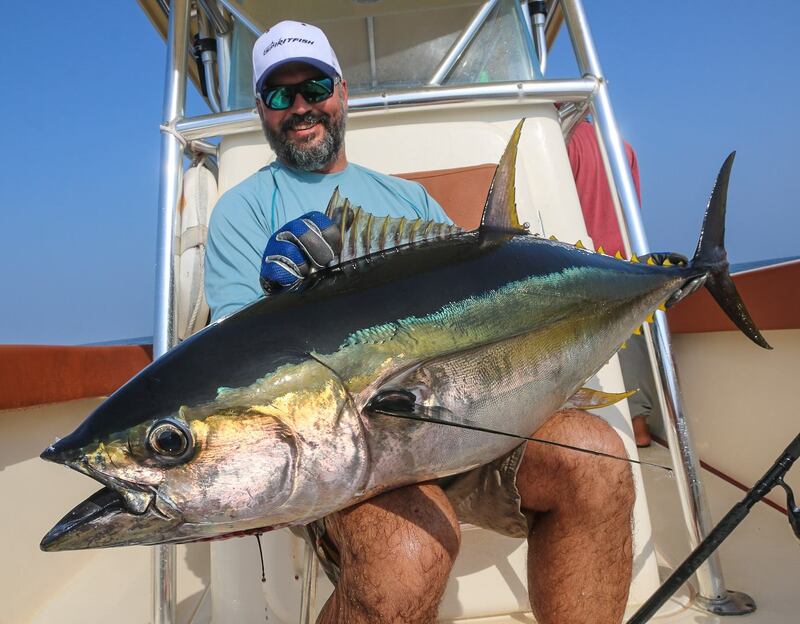 The main target in Musandam is normally the GTs and we use heavy popping gear which includes a good popping/stick bait rod like a Sportfish, Carpenter, Fisherman rods etc matched up with a high-end reel like Shimano Stella, good braid in the PE8 range and lures from 120-180gr range. We have some great jigging which we use PE6 jigging gear with jigs 150-250gr. 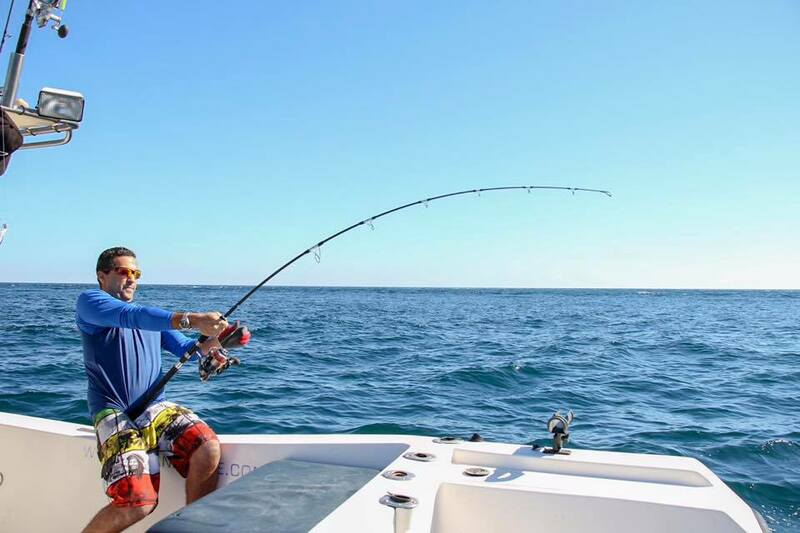 We also suggest bringing a light PE2-3 spinning rig for the longtail tuna, queenfish and smaller game fish. 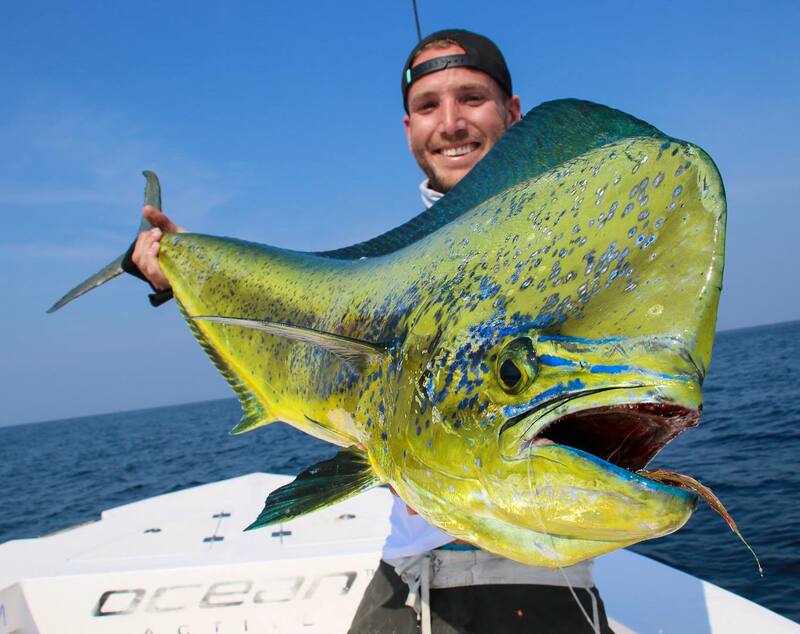 We get some good runs of sailfish so we do troll at stages for the sailfish on 30-40lbs trolling rigs. We also target a wide range of species on fly and fly fishing, this we mainly use 10# and 12# outfits. We can provide all of the equipment if required and can provide equipment list with more detailed information. Ocean Active uses some of the best locally custom built centre console boats. Ocean Active has helped design and outfit these boats to suit our requirements and to ensure that the boats are safe and fully equipped. Our first boat in the Musandam and the boat that we discovered GT fishing in the Oman was our trusty Al Sayyad 1 (meaning the fisher or hunter). She has caught thousands of GTs and plenty of other gamefish including sailfish, tuna, kingfish etc etc. 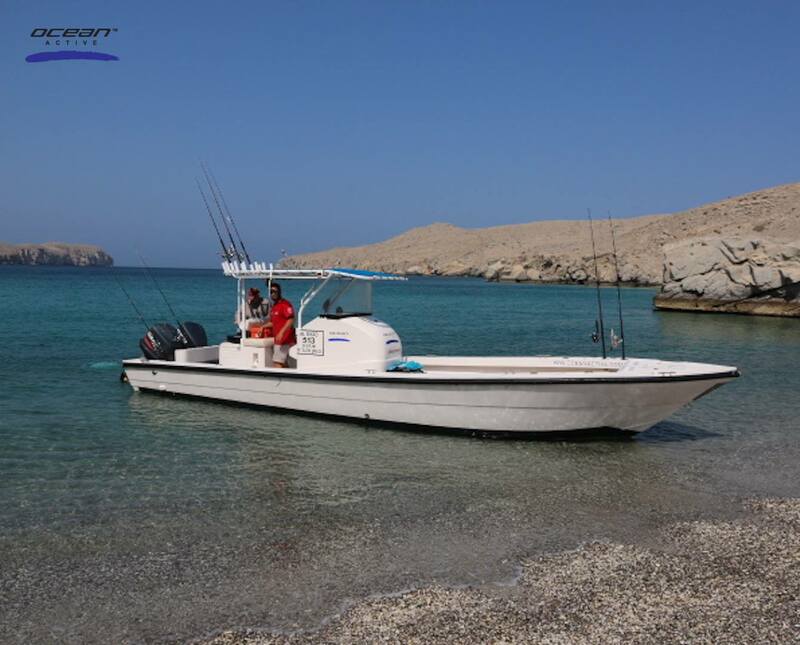 Al Sayyad 1 is a Hareb Marine Seamaster Center Console Boat fully rigged with twin 250hp 4 stroke Suzuki engines and all the safety and electronic equipment to ensure the best chance at catching fish and remaining safe. Al Sayyad 1 has a toilet, loads of storage space, 32-rod holders and live bait well. We have the boat fully rigged with the best possible fishing equipment (helps to own a fishing shop!) Please note that any broken or lost equipment will be charged at market rate. Our second boat in the Musandam is Al Sayyad 2 and is a brand new 32ft Bin Hadher Marine Center Console boat rigged with twin 2 stroke 150hp Yamahas, she has been built super tough to be our workhorse. This boat was built and completed in 2012 and is our new addition to our fleet. Due to finding new fishing areas and techniques we have decided to add another boat to offer clients additional capacity along with a boat targeting different species and using different techniques.